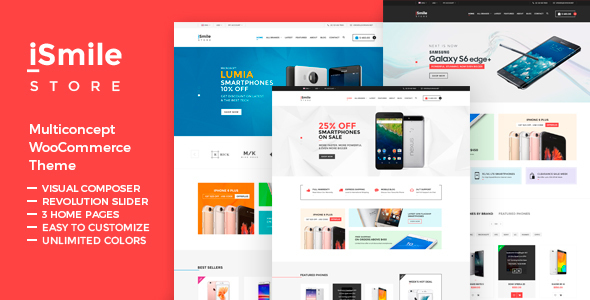 iSmile – Phones Market WordPress theme Created by Templines. This templates have specific characteristics, namely: iSmiler Store is a multi-concept and responsive WooCommerce WordPress Theme with clean and modern design. It is perfectly suitable for any kind of web shop that is selling tech items or any other types of . You can use this iSmile – Phones Market WordPress theme on WordPress category for cell phone, computers, desktop, Digital Cameras, electronics, mobile, phone, phone market and another uses. iSmiler Store is a multi-concept and responsive WooCommerce WordPress Theme with clean and modern design. It is perfectly suitable for any kind of web shop that is selling tech items or any other types of products.